In the morning we will be transferred to the port of Piraeus to catch the local ferry to Piraeus. Arrival in Santorini in the afternoon and transfer to your hotel. At leisure in Santorini. Even in the winter Santorini has its charm. Take advantage of your time to explore the quiet streets of Fira, walk along Nomikou street, and visit the picturesque village of Oia with the stunning views to the Caldera and the volcano. *For departures within Christmas Week, New Years’ week, and Greek Orthodox Easter week, please ask as itineraries may not be available or maybe altered. During Winter months (November to mid-April), there are no optional boat tours available to the caldera islands in Santorini. 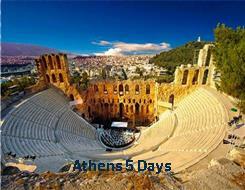 Ferry tickets Piraeus - Santorini with regular ferry economy class.